Can the Photo Blur Hide Your License Plate from Red Light Cameras? Red light camera photo of Photo Blur-protected plate. Rating: "...nearly always ineffective"
Photo Blur: "...nearly always ineffective"
See how the Photo Blur compares with similar products. The Photo Blur had some effect on our photo radar, sometimes making the first or last number difficult to read—but not impossible. Two violation notices we got from the Arizona Highway Patrol clearly displayed the number of our Blur-covered plate. 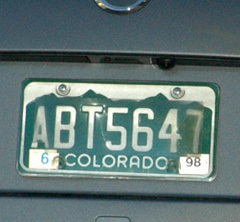 This plate cover had no effect on red light cameras positioned at a 10-degree angle. But at 35 degrees the last number was reliably obscured. Trouble is, very few cameras are positioned at the steeper angle.